For anyone that doesn't know,I am trying to lose 9lb in 9 weeks. Can I do it? I say yes I can! Why 9 weeks; because we going on holiday and I want to look better. Although we don't eat junk food and do eat more veg than I care to mention. BUT we do love cheese and eat far too much of it and it has to stop. Not entirely but we do need to cut down, not just to lose weight but to stay healthy. Everyone knows that eating a lot of bread is a sure way of piling on the pounds and usually for breakfast I have two slices of toast. On the days I go to work in my morning break I have another slice of toast. We get 15 minute break which isn't time to eat properly but I know I could do better, it's just for quickness I think. At weekends when I'm not working we (me and Paul the husband) have a bacon and egg sandwich and that too has to stop. So the new healthier me is going to happen. Luckily I don't have a lot of weight to lose but I know I will feel better about myself if (sorry when) I do so I'm giving it a go. Apart from 12 years ago when I wasn't very well, I've weighed 8 stone 4lb since forever - until now. Suddenly and I mean suddenly (must be my age I think) yes I'm 53 and I've put on 9lb so I now weigh 8 stone 13lb. That's just one pound off of 9 stone and if I carry on where will it end? Time to get a grip! To keep a track of my weight loss I bought some great weighing scales and saved money just by popping over to Vouchacodes - it's always good to check out their latest money saving vouchers before buying pretty much anything including items for the kitchen. So off I go and in my attempt to eat healthy and hopefully stay healthy I invented my amazing Weetabix Smoothie with Bio yogurt, goji berries, raspberries and wait for this....Chia seeds.......Oh yes, chia seeds, check me out! Chia seeds are among the healthiest foods out there. They are loaded with nutrients that can have important benefits for your body and brain. I was sent some from The Natural Health Market and have only just got round to trying them. Marvelous they are too. Chia seeds have formed a vital part of the South American diet for centuries; and are well known for their many health benefits. Although small, the seeds are packed with protein and fibre, filled with essential amino acids and are high in antioxidants. They also contain calcium, iron, selenium, zinc and magnesium. Inspired by my Froothie Optimum 9200 Power blender, I came up with this recipe. I'm not a one for adding up calories since I find it gets too confusing, all I know is this smoothie really does fill you up and it's got to be better than toast or indeed a bacon and egg sandwich. It's so easy to make too. Okay I'm not saying that this smoothie is really low in calories (it works out to something like 350kcal per serving). But the way I look at it is this will keep you going until lunch time and in my case it better than my usual toast (Warburtons Farmhouse with Flora light) is around 260kcal then I'm thinking this is the way to go. If you don't have time to make this in the morning and I certainly don't (I'm out of the house at 5.15 am) you can make it the night before and leave it in the fridge. I am trying to lose 9lb in 9 weeks.Can I do it? I say yes I can!Why 9 weeks; because we going on holiday and I want to look better. 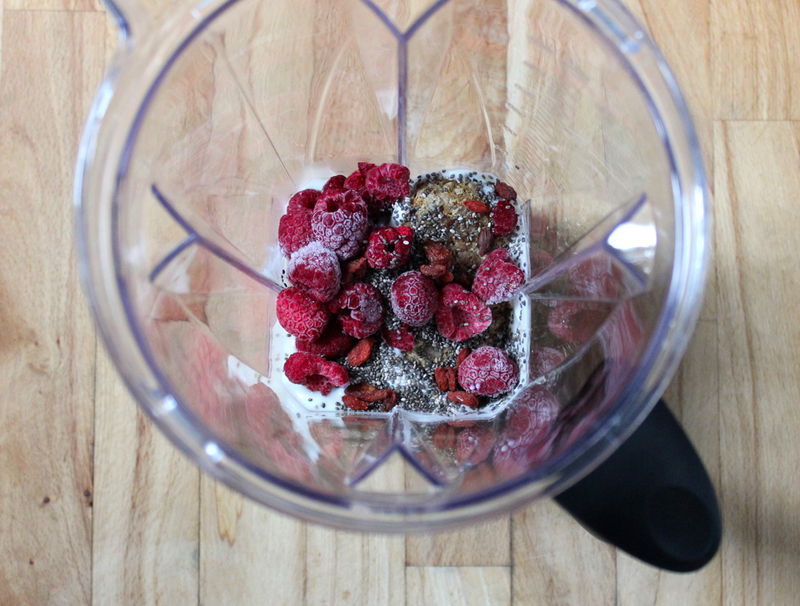 Throw the lot into a Power blender and whiz for 25-35 seconds. 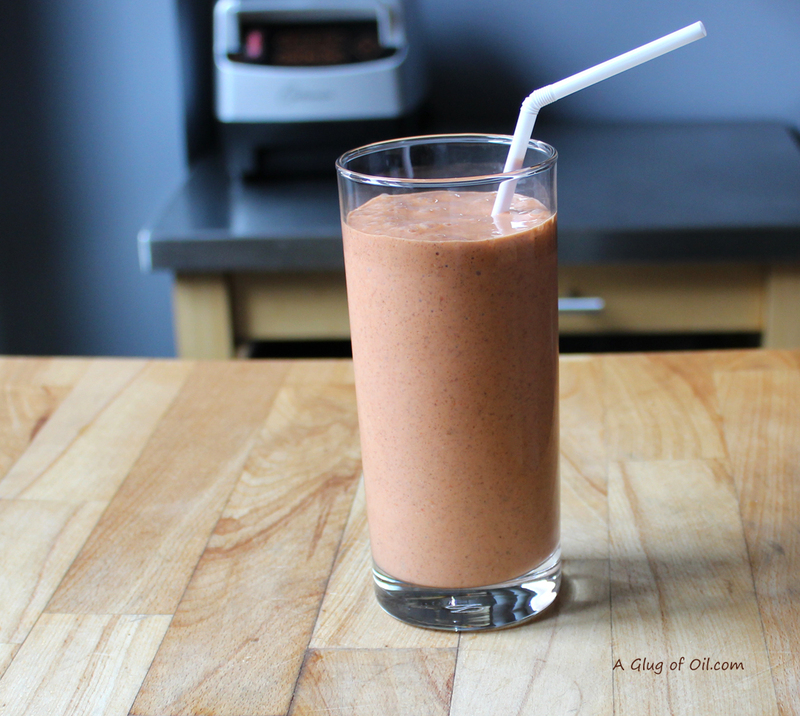 *Please note if you don't have a Power blender you will need to soak the goji berries (use a little of the milk) for a say 15 minutes before blending. 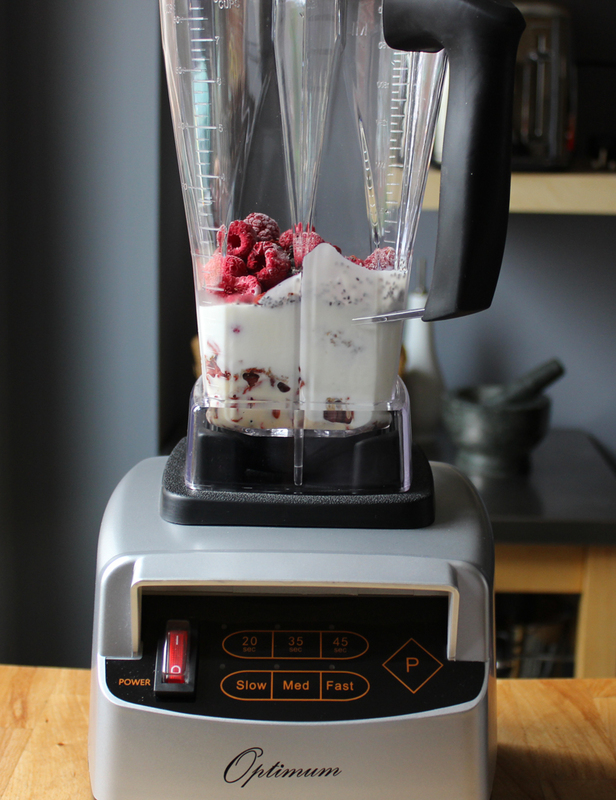 Check out my review of this amazing blender. What a great idea to add Weetabix to fill you up! This is a great smoothie - love it! You can do it Jan. 9lbs in 9 weeks is a very sensible target! 9 lbs in 9 day? Completely do-able, Jan. Lovely smoothie idea too - plenty of filling fibre to keep you away from the toaster! Love the colour and Weetabix is a great idea for a quick addition. I'll be trying that!